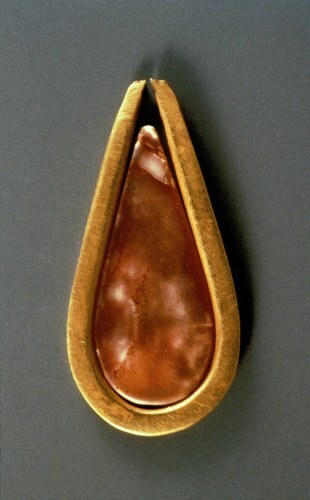 A pendant or ornament used for hair. When archaeologists first began excavating the ancient cities of Harappa and Mohenjo-daro in the 1920s and 1930s, they did so in the shadow of unique discoveries being made in Egypt and Mesopotamia. The social and political organization of these civilizations set the stan­dard against which other early state societies were compared. Furthermore, monumental stone architec­ture, sculptures made of stone or precious metals, elaborate grave goods, and royal tombs filled with gold and exotic treasures came to be used as a standard of ancient wealth. Based on the written records of Egypt and Mesopotamia, many scholars have assumed that indicators of wealth and socio-economic status were relatively uniform in the ancient world and that these indicators were used in much the same way in all early states.